That’s a question on the mind of Michael Ross. 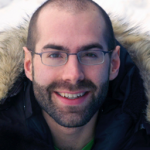 He’s the Natural Sciences and Engineering Research Council’s research chair in northern energy innovation, based out of Yukon College in Whitehorse. 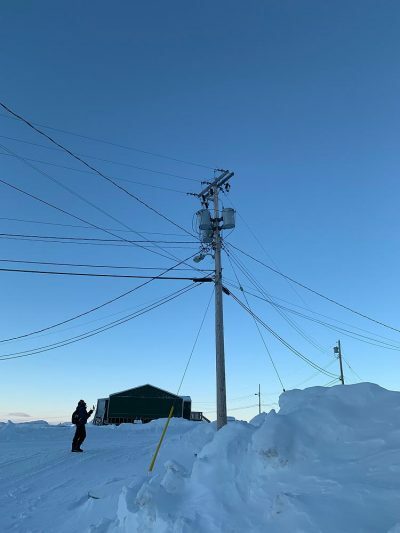 The question recently led him to Cape Dorset, where, accompanied by research assistant Jason Zrum, he inspected the different parts of the community’s electrical generation and transmission systems. It turns out that it’s not so simple to plug a wind turbine or solar array into the electrical grid of a remote northern community that’s presently entirely dependent on burning dirty, expensive diesel fuel. Do it wrong, and the community could suffer from brownouts or power surges. Ross aims to produce a report by early 2019 that will give a clear idea of how much renewable energy Cape Dorset’s grid will be able to handle. A similar grid impact study, done in Old Crow, Yukon, found that the fly-in-only community could be powered by solar panels and storage batteries, rather than diesel generators, for about 100 days a year. The work is part of a project, called Northern Energy Innovation, being done across Canada’s three northern territories, with the help of territorial utility companies. The report’s conclusions could be useful for QEC, or for others, including the municipality, if it’s interested in becoming an independent power producer. Ross’s work is being done with both wind and solar power in mind. “Those are technologies that are mostly mature. But it’s also a worst-case scenario, because you can’t tell the wind to blow or the sun to shine,” he said. Cape Dorset was chosen, in part, because it has a new diesel generation plant. Arviat is next. Ross hopes to eventually study all of Nunavut’s 25 communities, but that won’t be happening right away. The project, which is supported with $400,000 in annual funding, is intended to stretch across all three territories. It’s midway through a five-year term, with the option of renewing for another five years afterwards. Other work, done by WWF-Canada, has looked at the potential to tap wind and solar power in Nunavut’s communities. Ross’s work, meanwhile, looks at the challenges of hooking up these renewable energy sources to the local electrical grid. “It’s two sides of the same coin,” said Ross. Ross likens an electrical grid to a truck that’s being driven with cruise control engaged. Keeping the grid similarly at a steady “speed” while renewables switch on and off is important, because if the electrical frequency or voltage starts swinging around, it could fry electrical equipment. It’s also important to ensure that fail-safes don’t trip when they don’t need to. “It’s like a smoke detector in your house. You don’t want it to go off every time you’re cooking, but when there’s a fire, you want to make sure that it works,” said Ross. I know these researchers and professionals and all, but I have it on good authority (from the Iqaluit mayor’s husband) that solar and wind is, like, really really bad… or something. I am not sure where “Yes But” got the information that solar does not work . The evidence based on the 33 panels across the front of the Tunnganiksarvik Building of Nunavut Arcti College which were installed in 1993 and provided electricity to run the Campus corridor lights saving nearly $250,000 in energy costs over a 24 year period certainly proves solar does work. Those panels produced just three kilowatts of electricity. With the new addition to the building and the replacement with 44 panels increasing the power output to 10 kilowatts the College can expect even greater savings in the future. Additionally QEC has been running a small bank of solar panels on the main power plant in Iqaluit for the last three years. This small installation has produced electricity for the power grid in Iqaluit successfully for the last three years. Hamlets must set up a $1.5 million decommission escrow account for EACH wind turbine (WT) before anything gets erected. Ten, fifteen years and shorter are WT’s lifespan then must be completely replaced, costing roughly another $5 million each. But forget about replacing, because lucrative government cash/tax subsidies will vanish. Across Europe where subsidies have dried up, so do WT’s. Now back at the start with nothing. It’ll be a miracle if Nunavut gets lower electrical rates because anywhere WT’s are erected in the world electricity rates skyrocket. Nunavut must snap out of its hypnotic trance thinking that WT’s are so wonderful. 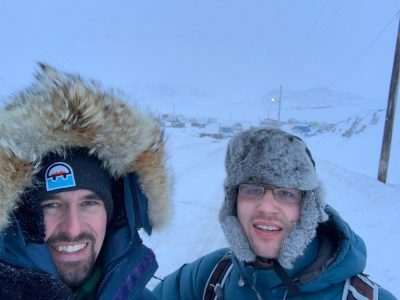 To get into serious electricity discussions with Andrew Scheer and Maxime Bernier in Iqaluit and the Kivalliq. 1. End the ridiculous carbon tax. 2. Supply Canada oil not imported from a brutal foreign government (guessing why called “dirty” oil in the article). 3. Immediately (when elected) help Nunavut build the Iqaluit hydro dam and Hydro/Internet line from Manitoba to Kivalliq without delay. Also there is geothermal (stick vertical columns below the permafrost, and harness the earth’s warm temperatures). Honestly if we are trying to save the world with the Carbon tax, all we needed to do is migrate away from Coal burning, and switch to oil. That would dramatically reduce the harmful emissions produced on a larger scale. Good point, Jim. Speaking of Maxime Bernier, who is running for the People’s Party of Canada for Nunavut in the election? “…but I have it on good authority (from the Iqaluit mayor’s husband) that solar and wind…” Haha. Good one. Sarcasm. No study required. There are numerous power companies in Canada that specify, construct, operate and integrate all forms of power generation including wind, solar, coal, gas, oil, … as part of their decades old portfolio. Just ask them. Surely noone still considers that conditions in the Arctic are unique to these advanced engineers. No Sarcasm. So JM over in the corner waving that big BLUE flag 😉 Has the oil industries in Canada ever received subsidies??? let the facts be known that every single industry in this Country receives subsidies at one time or another. I think we just saw a 1.6B$ bail out for the folks in Alberta yesterday to get more of the dirtiest oil in the planet out of the ground why not subsidies for WTs and Solar panels as well?